I've known this was going to happen for a while now, but didn't want to spill the beans too early! 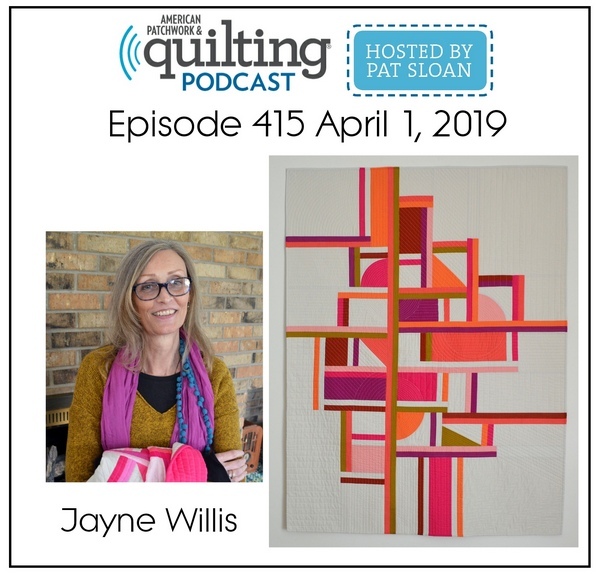 When I received an email from Pat Sloan asking if I'd like to be a guest on the American Patchwork & Quilting Podcast I think my heart stopped for just a little bit! I'm freaking out a little bit! I hope I can stay calm, talk in sentences and not sound too nervous during the interview! This can't be happening!!! Fool or not, April 1st will be a day I'm sure I won't soon forget! You can listen to the live podcast here: APQ Podcast Monday April 1st at 4:00 EST. Or you can also find all the episodes via i-Tunes: here! So, I hope you tune in some way or another! I'm pretty nervous about this, but also excited and so honored for this opportunity! Hopefully my brain and mouth will work together! There was a reason I picked April Fools Day...just in case!! WOW! I'm sure you'll do well. Just talking about what you enjoy doing should calm the nerves. I hope so! Public speaking isn’t something that comes naturally to me! I’ll do my best and I’m sure Pat will guide me along the way! Thanks Libby! I didn’t see this opportunity coming…but I’ll embrace it and then have a big glass of wine afterwards! I’ll do my best! I’m excited and petrified, but I’m looking forward to it! oh wonderful! Pat really helps everything be ok!! Relax and have fun. Can't wait to listen in! How awesome! You will be fine, just go to your happy place and think quilty thoughts! You got this, Jayne!! Deep breaths. You will do just fine. After the first minute you will be doing just fine. You won’t have to face an audience and you will be talking about quilting to other Quilters. What’s better than that? You'll do just fine. How fun and exciting. Enjoy every minute! Pat is amazing at keeping you at ease. Have fun!!! This is so excellent - can't wait to hear it! You've come a long way, baby! Love to you, Jayne! Congrats. I'll have to find some time to listen. I'm sure you were amazing. I was in a Mood :: Two Moods!